All eyes are on Samsung right now, and the company’s no doubt glamorous Galaxy Note 9 launch event next week, but since we already know everything there is to know about that repetitive flagship, it’s only fair we start paying close attention to Huawei’s upcoming hero phone as well. The Mate 20 (Pro) could bring some true innovation to the table by implementing in-display fingerprint recognition technology, adopting a flexible OLED screen, and packing a state-of-the-art new in-house processor. Whether the Kirin 980 SoC will contain a custom GPU or not, the consensus among industry insiders is the beastly chipset will move to a super-advanced 7 nm fabrication process, allowing it to occupy less space and consume less energy while delivering more raw speed than Qualcomm’s Snapdragon 845. 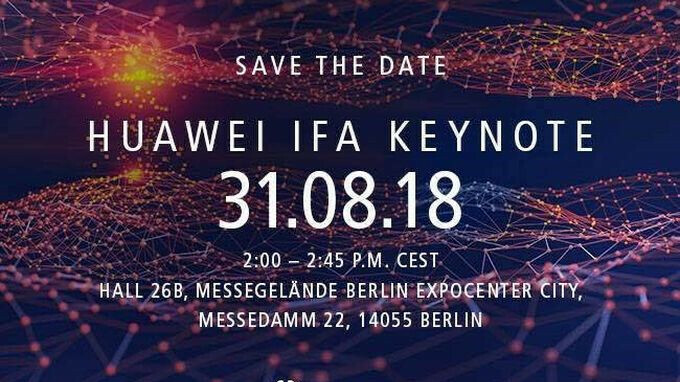 History suggests the Huawei Mate 20 and/or Mate 20 Pro will be officially unveiled a few months down the line (in October or maybe November), but the powerful phone’s “brains” could see daylight at the IFA trade show in Berlin. The company has confirmed it will have something to announce in the capital city of Germany on August 31, scheduling a (fairly short) keynote for 2 P.M. CEST, which should take about 45 minutes. That’s definitely not enough time to hype up both the Kirin 980 and Mate 20, so if Huawei has an actual commercial product to unveil at IFA, it’ll probably be something with lower-end specifications. Most likely, we’ll simply hear all about the next-gen flagship SoC from the world’s third-largest smartphone vendor, which sounds far more exciting than the launch of yet another budget-friendly mid-range handset of some sort. There was a lot of hope for Kirin 970, yet it hardly matched SD 835, that was about 9 months older.